Howdy! Welcome to the documentation site for the Divi Paving child theme and layout pack. If you didn’t realize it already, this child theme and layout pack are based on WordPress. You will need a WordPress installed on a server to begin. If you don’t have this already, no problem. Just contact us and we can get that set up for you in a jiffy. To avoid any issues during installation it is highly recommended that you use this child theme or layout pack on a fresh installation of WordPress. When the install is complete click on ‘Activate’, you will then see Divi Paving as the active theme in your theme panel. On the left-hand side, you will see the new menu item called Divi Paving. Hover over this and click ‘Easy Demo Import’. The Divi Paving child theme or layout pack comes with a simple footer editor located in the theme customizer. Navigate to ‘Divi>Theme Customizer’ in your WordPress dashboard. When the customizer opens click on ‘Edit Footer Links>Footer Links Editor’ and change the details to your own, and don’t forget to save. 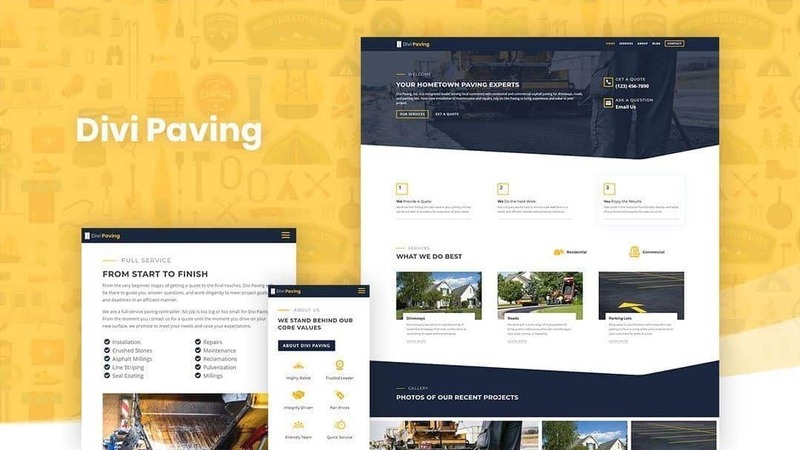 Your site should now look just like the demo at https://demos.peeayecreative.com/divi-paving, the only thing left to do is replace the text with your own and the placeholder images with your own images. To edit the CSS, I recommend using Editey. This is a Google Drive add-on that works just like Google Docs, but for code instead. Copy the CSS from ‘Divi>Theme Options>Custom CSS’ and place it into a CSS Editey document. From there, use ‘Edit>find and replace…’ to change your hex color values to match your brand. The two colors you may want to change are the navy blue #1b273d theme color and the golden yellow #ffb600 accent color.